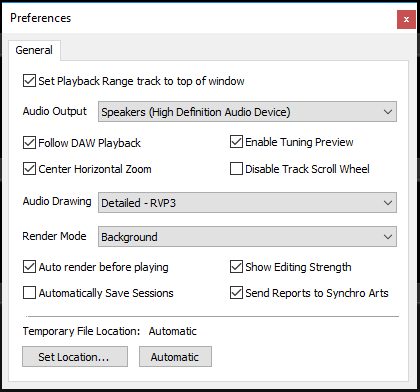 To set the Directly-connected audio hardware, in the Revoice Pro menu bar, under Revoice Pro, select Preferences and then the General tab. 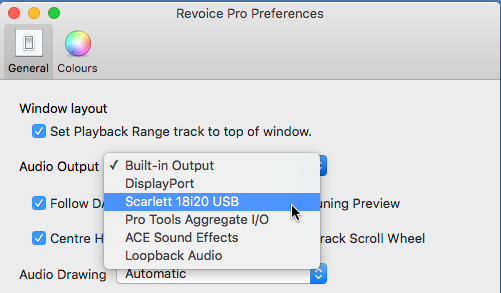 The menu similar to that in the first image below should appear and the user can select the Audio Output Device drop-down menu to chose Built-in Output or other directly connected audio hardware listed as shown in the second image below (in this example, a Scarlett 18i20 USB is being selected). This does NOT apply to Pro Tools HD hardware, for which see Monitoring through Pro Tools HD hardware. 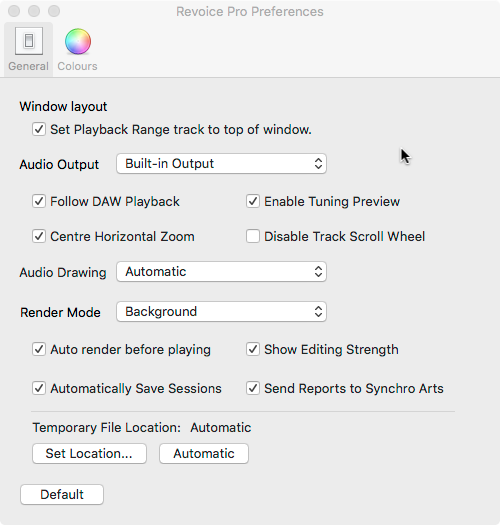 To set the Directly-connected audio hardware, in the Revoice Pro menu bar, in the Edit menu, select Preferences. The menu similar to that shown below should appear and the user can select the Audio Output drop-down menu to chose Speakers as shown, or any other directly connected audio hardware that appears in the list.